Senior living facilities are largely governed by individual state regulations, and many states do not mandate quality assurance and compliance checks. As a result, these organizations are left with few resources and limited funds to ensure quality; they also lack the monitoring necessary to measure and improve OSHA compliance, as well as ensure the effectiveness of their disaster preparedness and infection control programs. 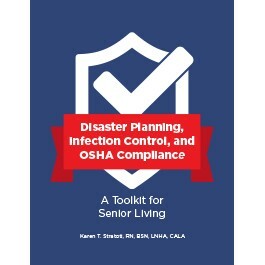 Disaster Planning, Infection Control, and OSHA Compliance: A Toolkit for Senior Living is a cost-effective, all-inclusive guide to improve safety and satisfaction in your senior living facility across the board, from establishing fall prevention programs to making sure you’re prepared for even the worst-case scenarios. Through case studies, regulation breakdowns, and downloadable tools—such as checklists, interactive staff training activities, sample policies and procedures, and nearly two dozen in-services—this resource, written and reviewed by industry experts, will help you increase quality assurance, boost customer satisfaction, and keep your residents and employees safe. Karen T. Stratoti, RN, BSN, LNHA, CALA, is CEO of Excellence in Caring, a consulting and management firm in New Jersey serving long-term care, assisted living, continuing care retirement, and adult medical day care communities on the east coast. She has 25 years of experience working in the healthcare industry, including as a registered nurse in New Jersey and Pennsylvania. Her focused expertise is on long-term care, assisted living/comprehensive personal care homes, and adult medical day care centers’ federal and state regulations. Stratoti holds several national and supervisory healthcare certificates, including MDS 3.0 certification from AHCA and New Jersey Certification in Assisted Living Administration, as well as numerous professional affiliations. She authored Excellence in Caring: An Assisted Living Guide to Community Development and Hope in 2003 and has conducted numerous public presentations and in-services.